The Redmond Municipal Airport announced late Thursday the three-week runway intersection construction project will be completed on time and commercial service will resume Monday as scheduled. Despite rain delays, it's gone so well, private aircraft will return Friday. Runway 5-23 re-construction work, where both runways intersect, is why the airfield was originally scheduled to close for three weeks, May 2-22. But RDM’s secondary Runway 11-29 is scheduled to open for general aviation aircraft (private planes) on Friday at 4 pm, which officials said is earlier than planned. Commercial passenger aircraft,,including Alaska Airlines, American Airlines, Delta and United, will return their scheduled passenger service to RDM on Monday as planned. Although the contractor, Knife River, faced a rain delay equivalent to more than three days, stopping the paving work, officials said they managed to complete the intersection reconstruction portion of the project early,, allowing the airport to reopen Runway 11-29 to aircraft. In fact, commercial service could have resumed earlier. But officials said airlines aren't able to to adjust their schedules quickly enough to bring their aircraft back to RDM before Monday, the scheduled resumption. Runway 5-23 will remain closed as scheduled for the remaining reconstruction work to be completed. 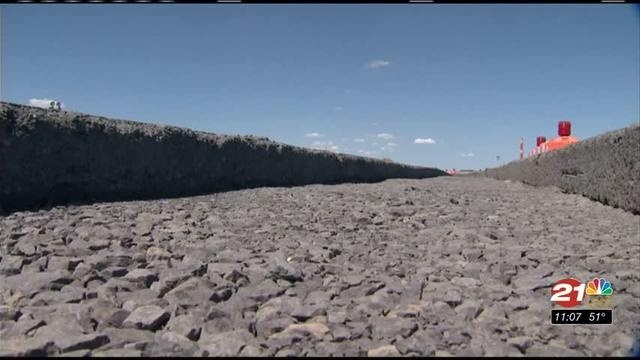 That work is scheduled for completion at the end of August, officials said. Aircraft landed long and hit a fence. 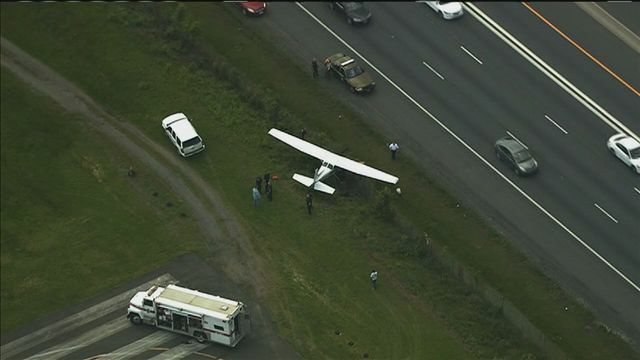 A small plane crashed near the Freeway Airport in Mitchellville, Maryland Thursday -- narrowly missing busy Route 50. No one was injured, Maryland State Police said. 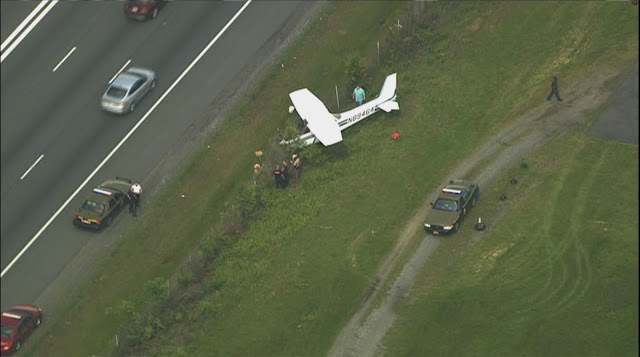 The Cessna 172P Skyhawk II crashed into a fence close to eastbound Route 50, slowing traffic on the highway. The plane was being flown by a student pilot, state police said. Prince George's County Fire also responded to the scene. The Federal Aviation Administration and the National Transpiration Safety Board were contacted and will be conducting a follow-up investigation. BOWIE, Md. 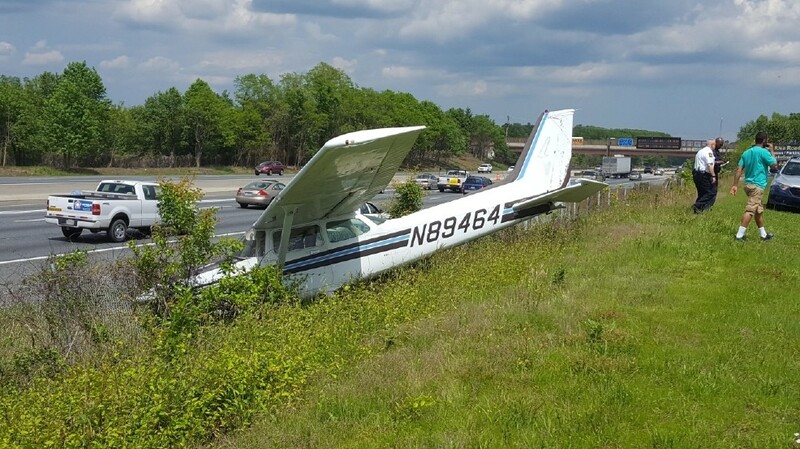 (WJZ)– No one was injured after a plane crashes near Freeway Airport on Thursday afternoon. Authorities say the plane crashed into a small fence that borders US-50. The crash apparently happened during landing training when the pilot overshot the runway. The plane was identified as a Cessna 172P Skyhawk II, according to Mark Brady, a spokesperson for EMS and fire services in Prince Georges County. BOWIE, Md. 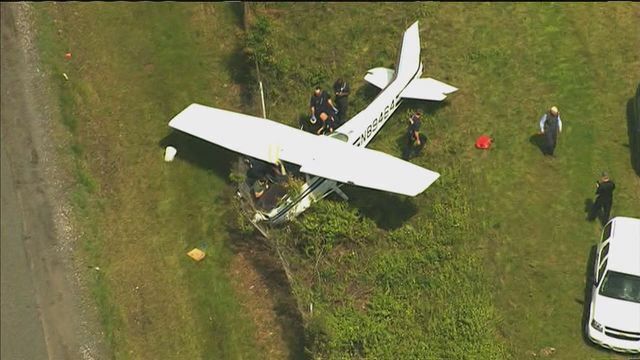 (ABC7) — A small plane hit a fence bordering Rt. 50 while attempting a landing at Freeway Airport in Bowie, fire and police officials say. A Cessna 172 with a student pilot in control overshot the runway at about 2:45 p.m., according to a Maryland State Police spokesperson. The only passenger in the four-seater was the instructor. No injuries have been reported, says Mark Brady, Prince George's County Fire PIO. Although there were no lane closures, traffic delays extended about three miles on Eastbound Rt. 50, police say . 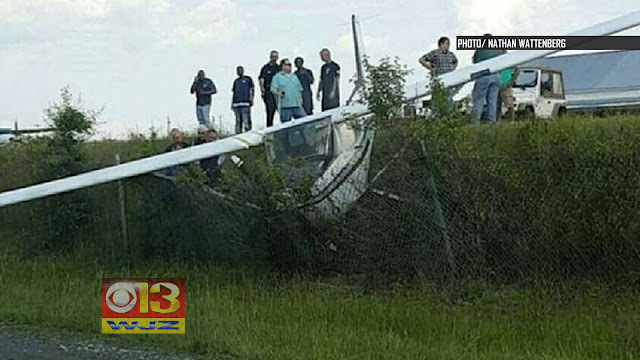 The registered owner of the plane is Freeway Airport, Inc. in Mitchellville, Md., according to public records. 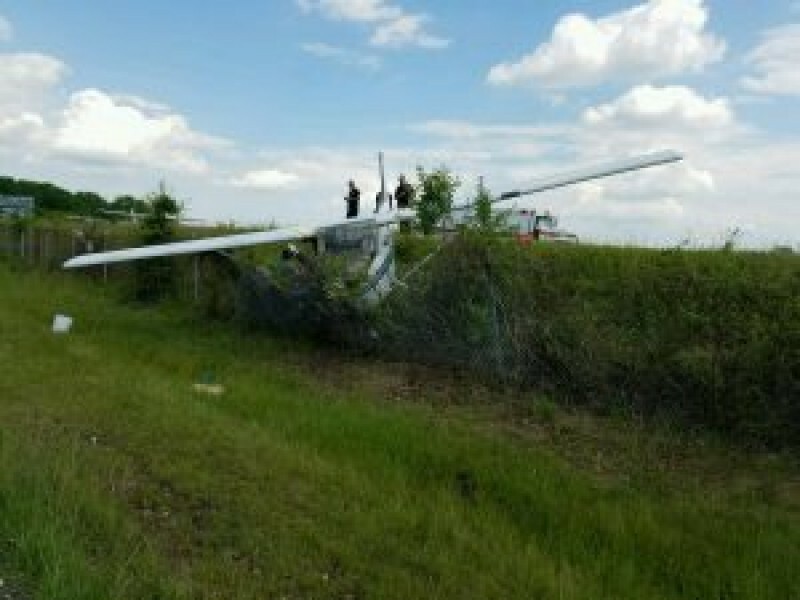 A Cessna 172P Skyhawk II plane overshot the runway while landing at Freeway Airport and skidded into the fence at the edge of the property, just a few feet from the shoulder of westbound Route 50 near Bowie. The accident happened about 2:45 on Thursday afternoon. There were no injuries reported, according to Mark Brady, a spokesman for the Prince George's County fire department. Apparently, the plane was being operated at the time by a trainee, who was in the process of building up enough hours to qualify for a pilot's license. Maryland State Police were handling the investigation, Brady said. The accident happened off to the right side of the highway and did not necessitate any lane closures. However, drivers passing by slowed to have a look at the plane, which crashed nose-first into the fence, causing extended backups on westbound Route 50. At one point, the backup was three miles long, according to police. The Federal Aviation Administration and National Transportation Safety Board will be conducting a follow up investigation, state police said. MITCHELLVILLE, Md. 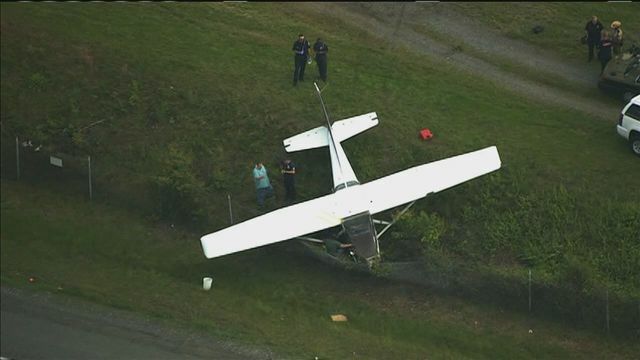 (AP) — Maryland State Police say a small plane landing at a Prince George's County airport crashed into a fence. No one was hurt. 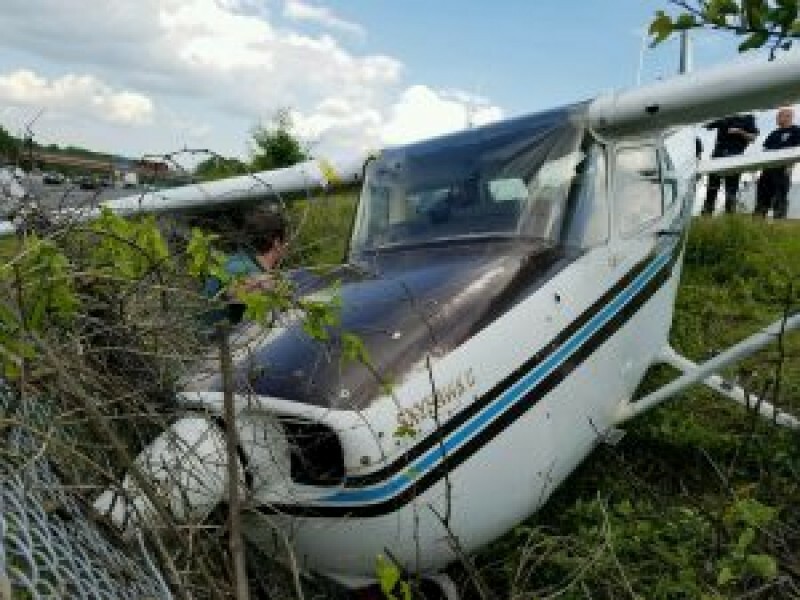 Troopers said in a news release that about 2:45 p.m. Thursday, a student pilot and a trainer were in a Cessna 172P Skyhawk II in Mitchellville. Police say the student pilot was landing the plane went it went off the end of the runway and crashed into a fence that separates the airport from US Route 50. Troopers say the Federal Aviation Administration and the National Transpiration Safety Board have been notified. SHEFFIELD >> Following several years of litigation, the state Appeals Court ruled last week that a Sheffield man cannot be prohibited by the town from flying in and out of his private airfield, unless the town is specifically protected by a bylaw that addresses the activity. In 2006, according to court documents, John R. Hanlon Jr. constructed an 80-foot-wide airstrip that was 1,250 feet long on his property. The 38-acre parcel also contained a number of outbuildings that were suitable for storing aircraft. The land is located on a private road off Hulett Hill Road near the Sheffield-New Marlborough border. Attorney Alexandra Glover, representing Hanlon, said her client was pleased with the decision. The Appeals Court ruled that while the Town of Sheffield prohibits, by zoning, commercial aviation enterprises in most of the town, it cannot prohibit private aviation unless a specific, applicable bylaw is approved by the Massachusetts Department of Transportation Aeronautics Division. The Appeals Court, in its ruling, differentiated between those two actions. Sheffield's zoning bylaws did not have that permission said Glover in an email. She said she believes the ruling is a key one because many towns in the Berkshires and beyond are not cognizant of the provision that aviation-related bylaws are subject to the DOT's approval. "I don't think you'll find a lot of towns in the Berkshires who are aware of this," she wrote in an email. Hanlon flew aircraft in and out of the airstrip for several years. The strip, according to court documents, was registered with the Federal Aviation Administration. In 2011, the town's building inspector issued Hanlon a cease-and-desist order, ruling that the town's zoning bylaws did not allow private airstrips. The town's bylaws did allow commercial airstrips under certain specific conditions, but omitted any mention of private airstrips. Like the bylaws of many towns in the Berkshires and in Massachusetts, the town operates on the principle that if an activity is not mentioned, it is not allowed. Hanlon appealed the decision to the Sheffield Zoning Board of Appeals. After four hearings on the matter in January and February of 2012, the ZBA upheld the building inspector's ruling. Hanlon appealed the decision to the state Land Court in 2012. The ruling came down on Friday, May 13. The court ruled that towns that do not obtain DOT approval for these regulations cannot prohibit private airfields and air operations, even if there are no specific regulations in a town's bylaw handbook addressing private airfields. Town administrator Rhonda LaBombard said that she hasn't read the entire decision, and has yet to present it to the selectmen and thus declined to comment. COTTONWOOD -- The Cottonwood Council Chamber was packed Tuesday night with pilots, hangar owners and others associated with the Cottonwood airport. The issue that gathered them centers on Cottonwood's long-term lease rates for the city land on which the hangars sit. This matter has been simmering since 2008. At the end of a two-hour discussion, the council called for a special committee of stakeholders and decision makers to settle the matter. The agenda item has been repeatedly pushed by hangar owner Lawrence Minch, who felt that he among others were wronged because of two standards used by the city to lease hangar space. Almost every hangar at the airport is privately-owned on land leased to owners by the city. Most have 25-year leases on their land, but expect to use their hangar for much longer. The issue centers on a lot of money and that fact that the leases provide that the hangars become the property of the city at the end of the lease. But some owners negotiated a 25-year lease and the opportunity to negotiate based on a new valuation. Others got a 25-year lease with the option for a 15-year extension. The difference apparently is the way the leases are worded and whether owners can expect a 25-year lease, or essentially, a 40-year lease. A couple of owners who signed only the original lease without the extension option, said if the terms were not the same as the Larry Green lease, they would move their hangar off the ground after 25 years and leave only the bare ground. Councilman Tim Elinski, said "25 years is too short a term. It is important to have a written policy. It's our job to provide certainty. We want a level rate across the board with a trend over a five- to 10-year period." A big stumbling block is the fact that the airport has no written policy, and in fact, Airport Manager Morgan Scott could find no written policy when surveying 11 Arizona airports he researched. Mayor Diane Joens insisted that, "We are always supportive of pilots and what they bring to the community in terms of economic development. But the airport belongs to its citizens." "We need to have transparency and equity. I am an advocate for changing the leases," said Councilman Randy Garrison. "This is a critical issue," said Councilman Terence Pratt, "We are not utilizing the airport as an economic center." Alan Paxhia, president of the Cottonwood Hangar Association, told the council his hanger is worth $270,000 and that "40 years allows for amortization of the building, but the city wants to rent the hangar back to us after 25 years." "You have no right to our building until after 40 years," Paxhia insisted. "The owners are being stonewalled and you are not going to negotiate until the lease expires." Janet Thompson is another hangar owner. Since her husband died, she wants to sell her hangar. She says that it is now "worth $220,000, but if had a 15-year extension, it would be worth $305,000." Much of the debate revolves around specifics of the law including "gifting public property", "constrained by the Arizona constitution," "fee-title must remain in hands of city, because of millions in grant funding to maintain the airport," "adequate consideration," "duty on part of city to negotiate." Hangar owners simply want a fair deal and many on the Cottonwood council agreed with them. Lawrence Minch, hangar owner who has pushed the issue, said he believes the FAA will have the upper hand, "I would be more worried about losing your airport than changing a line in my lease." Former Cottonwood Airport Chairman John Altizer asked the council, "How much is it going to cost you. You are not going to get a millions of dollars' worth of hangars without a fight." Attorney Steve Horton admitted, "I have become a bit of an issue." He suggested the city find an alternative attorney to assist with the negotiation. In the end, the council approved forming a committee to work on a land and hangar lease policy (for the Cottonwood Airport) composed of an airport consultant, an attorney, an airport commissioner, council member, citizen, an airport manager, representative from the FAA, and a hangar owner. Those are just some of the words Norwegian Air passengers are using to describe the discount airline, which is patiently waiting for a foreign air carrier permit from the U.S. government for its Irish subsidiary, Norwegian Air International (NAI). Many customers rave about its low fares, new planes and friendly service. But that’s not how some U.S. airlines describe Norwegian Air. Critics, including labor unions and competitors, say the airline flouts labor laws, threatens American jobs and should be banned from flying in the United States. Now, after two years in a holding pattern and extensive vetting by regulators, the Department of Transportation is on the verge of granting Norwegian Air the permission it requested. Last month, the DOT issued a “show cause” order for its Irish subsidiary, soliciting public comments. Observers believe the airline is about to get the all-clear from authorities, which will allow Norwegian Air to expand worldwide. How will that affect you? It depends on who you are. Edward Wytkind, president of the Transportation Trades Department, a coalition of 32 member unions representing transportation workers, predicts that NAI’s approval “will destroy fair competition and extinguish middle-class airline jobs here and in Europe.” In other words, if you or a loved one works in the transportation business, you might feel this a little. Some members of Congress agree. Reps. Peter A. DeFazio (D-Ore.), Frank A. LoBiondo (R-N.J.), Rick Larsen (D-Wash.) and Lynn A. Westmoreland (R-Ga.) quickly introduced a bill that they say would prevent the DOT from permitting a foreign air carrier to operate between European countries and the United States unless the carrier complies with basic, fair U.S. or European Union labor standards — a law that would effectively throttle Norwegian Air’s expansion. The bill is unlikely to pass. “Our opponents have created a wildly inaccurate fear-mongering situation,” says Réal Hamilton-Romeo, a Norwegian Air spokeswoman. Green-lighting Norwegian Air, she says, would help create more American cabin-crew jobs working for Norwegian Air; help sustain and support more than 90,000 American jobs through an $18.5 billion order with Boeing; bring more tourists to the United States; and add direct air service to Europe for American air travelers. Northeastern University economist Harlan Platt says the debate reminds him of taxis fighting the inevitable spread of Uber. But the new, better way of running an airline — Norwegian Air is finding ways to reduce costs by breaking the old model of basing an airline in one country, employing people there and hiring its crew there — will ultimately win, to the benefit of passengers. Maybe the real question is: What do you give up when you fly on Norwegian Air? Not much, passengers say. Norwegian Air follows the “a la carte” pricing model popularized by the airline industry about a decade ago, selling you a seat but asking you to pay for anything extra. That includes imposing fees for checked luggage, drinks, in-flight meals, phone reservations, seat assignments, snacks and ticket changes. Even so, Annalisa Fernandez, an author based in Riverside, Conn., says Norwegian Air is surprisingly affordable. “We flew Norwegian Air to Spain last summer to take the kids to summer camp and plan to do it again this year,” she says. Airfare for a family of five set the family back $4,000, $2,000 less than she would have paid on a conventional airline. Fernandez did her research before choosing the flight. “I trust the Norwegians to not cut corners on safety,” she adds. Transatlantic airfares rise significantly during the summer, a time of peak demand. With only a handful of airlines competing on many popular routes, thanks to government-approved airline alliances that are granted antitrust immunity, you don’t often hear passengers talking about affordable tickets. Here’s another word you rarely hear used to describe a flight: comfortable. Jonathan Weber, who owns a Web design firm in Stroudsburg, Pa., paid $256 to fly on Norwegian Air from New York to Oslo. He was impressed by the new aircraft and positive work ethic. Actually, Norwegian Air isn’t applying to fly domestic routes — under an antiquated U.S. law, foreign carriers are not allowed to do that — but Weber’s comments underscore the level of unhappiness American air travelers feel with their own carriers. There’s a strong sense among passengers that the government shouldn’t prop up a system that doesn’t serve them well. Time and again, the experts and air travelers I spoke with for this article mentioned the broken system: Airlines no longer compete, their fares are too high and their service levels are too low. And time and again, they expressed the hope that an airline like Norwegian Air can change the system by offering a better way to fly and disrupting an inefficient model. Then again, what if the critics are right? What if Norwegian Air’s promises to offer low fares, better service and create American jobs turn out to be empty? What if Norwegian Air’s expansion decimates a vital American industry, taking with it the livelihood of thousands of taxpayers? Less than a year after opening its 82,300-square-foot manufacturing facility, Bell Helicopter is changing which products it will build in Lafayette. In a conference call Thursday afternoon, the company president and CEO Mitch Snyder said Bell is relocating several programs across the United States as it deals with a downturn in the commercial market. "The 505 Jet Ranger X manufacturing facility in Lafayette, Louisiana, will relocate to our Maribel manufacturing and distribution facility in Canada, "Snyder said. "We remain committed to our Lafayette employees in the state of Louisiana. Therefore the Lafayette facility will receive the Bell 525 Relentless cabin sub-assembly, relocating from Amarillo." The company will also relocate its Grumman MQ-8C aerial vehicle-manufacturing facility from Ozark, Alabama, into the Lafayette Assembly Center, he said. The state funded the $26.3 million construction of assembly center, which opened in August. The building is owned by the Lafayette Regional Airport. Bell has been leasing the facility and committed to making an additional $11.5 million capital investment in equipment and tooling. On Thursday, Snyder said the company is negotiating with officials to ensure that Bell Helicopter is keeping its end of the bargain with state and local governments. “We are sitting down with the economic group right now and going through that," he said. When the assembly center opened in August, former Gov. Bobby Jindal, who was on the presidential campaign trail at the time, praised Bell's move to Lafayette in 2015 as "a new era in Louisiana’s rich history in aerospace." But there were signs of trouble months before the local assembly center's opening. In April, 2015, the company announced plans to lay off more than 1,000 employees. Shortly after the announcement, Bell Helicopter spokeswoman Ashleigh Dana Told The Daily Advertiser that the company was invested in the Lafayette assembly center with more than 300 orders for the 505 Jet Ranger X models. The 505 Jet Ranger X final assembly facility also promised to deliver 115 new local jobs. Snyder said there are 27 employees at the facility who now will be part of the transition process to move the 505 Jet Ranger X assembly to Canada and move the Texas and Alabama operations to Lafayette. After the transition, the company will assess its staffing in Lafayette, Snyder said. "We don't know yet at this point. We are still looking at the numbers," he said. Snyder said Thursday that the 505 Jet Ranger X manufacturing operation will not be returning to Lafayette. The commercial aviation industry has taken massive economic blows for three consecutive years, Snyder said. The decision to shift the company's facilities is an act of survival. “It’s worldwide; it’s industry-wide," he said. "We’ve said it numerous times from 2013 to 2015 it was down by about 50 percent. From 2015 to now, it’s worse." Bell Helicopter said Thursday it would assemble its 505 Jet Ranger X in Mirabel, Canada, and abandon plans to build the new-model aircraft at a $26.3 million Lafayette facility that Louisiana financed to lure the company and 115 jobs. Instead, an undetermined number of employees at the Lafayette plant will handle some of the cabin assembly for Bell’s 505 Relentless helicopter, work that is being transferred from a plant in Amarillo, Texas, Bell CEO and President Mitch Snyder said in a conference call Thursday. Snyder said the Lafayette plant also will handle modifications to the Northrop Gruman MQ-8C Fire Scout unmanned aerial vehicle, a Bell project that is being moved from the company’s facility in Ozark, Alabama. Snyder said the company’s decision to change directions was driven by a severe downturn worldwide in the demand for commercial aircraft. The company has 27 employees in Lafayette, most of them hired since the facility was completed in August. Those workers will help transition the projects. Snyder said the ultimate number of workers hired in Lafayette will depend on the company’s labor needs, which will be determined later. Former Gov. Bobby Jindal led an entourage of state, local and Bell officials in announcing that Bell would locate the Jet Ranger 505 X assembly plant on 14.5 acres at Lafayette Regional Airport. State money paid for the $26.3 million hangar, then the state handed ownership of the hangar to the Lafayette Airport Commission, which leases the 83,000-square-foot building to Bell. The state also offered incentives, such as performance-based grants of $4 million for lease support, $200,000 for relocation expenses and $3.8 million for infrastructure improvements. In return, Bell said it would invest $11.4 million in equipment and tools and would hire 115 employees. Louisiana officials Thursday sought out the positive parts of Bell’s decision. Gregg Gothreaux, head of the Lafayette Economic Development Authority, said Thursday the news could be worse. 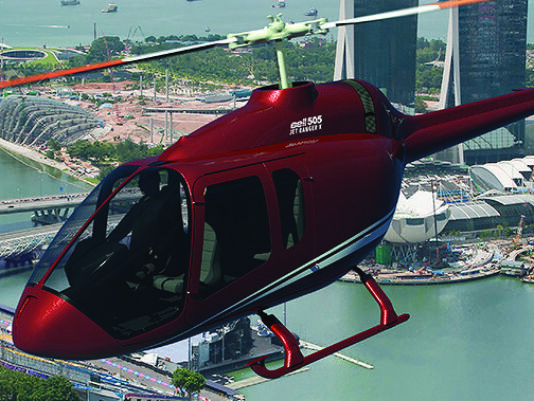 Bell continues to conduct tests and certify its 505 Jet Ranger X. The news about Bell changing its plans comes after the company officials, including Lafayette manager Paul Watts, said in late March that the plant’s assembly operations and hiring remained on schedule. They said then that full production of 200 Jet Ranger 505s a year would commence in 2017. The news that was released Thursday was welcomed in Canada, where final assembly of the chopper will now be done in Mirabel, near Montreal in Quebec. “Today’s announcement is a good news story of jobs and future growth in the Canadian aerospace sector and of an innovative R&D legacy that will last far beyond the manufacture of this helicopter,” Navdeep Bains, Canada minister of innovation, science and economic development, said in the Bell statement. Bell Helicopter is a subsidiary of Textron. The airplane collided with trees about 1 hour into a night cross-country flight. The weather was clear, with nearly a full moon and unrestricted visibility. The airplane was not reported overdue, but air traffic control began receiving reports of an emergency locator transmitter shortly after the accident. 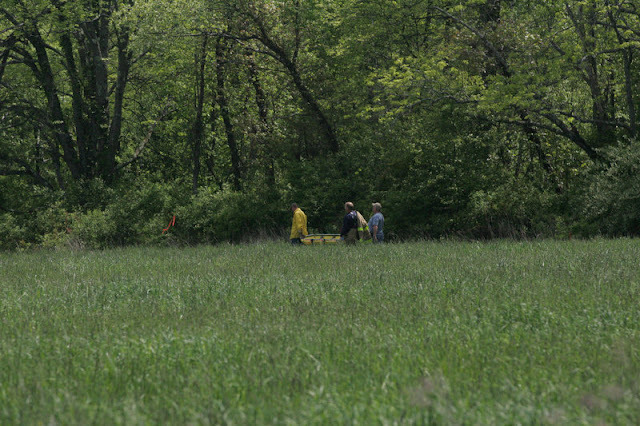 The wreckage was subsequently located 3 days later in a wooded area about 6 miles north of an airport. Examination of the wreckage did not reveal any preimpact mechanical malfunctions. While purchasing fuel prior to the flight, the pilot stated that he would be away for 1 week, but did not specify a destination. Autopsy and toxicological testing did not reveal any medical anomalies that would have affected the pilot's performance. It was unlikely that the pilot became incapacitated as the airplane's track was consistent with control inputs during the final descent. A collision with terrain for reasons that could not be determined as the investigation did not reveal any postaccident anomalies with the airplane or pilot. 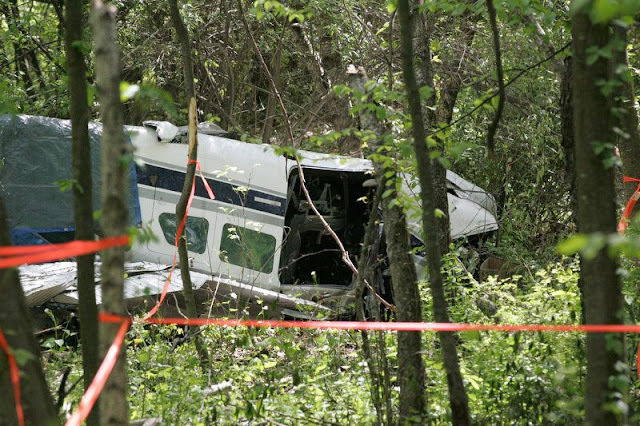 On May 16, 2016, about 2242 eastern daylight time, a Cessna 210F, N6450N, was substantially damaged when it impacted wooded terrain under unknown circumstances near Wantage, New Jersey. The private pilot was fatally injured. The airplane was registered to and operated by a private individual as a personal flight conducted under the provisions of 14 Code of Federal Regulations Part 91. Night visual meteorological conditions prevailed and no flight plan was filed for the flight that departed Griffiss International Airport (RME), Rome, New York, at 2143. The flight's destination was unknown. There were no known witnesses to the accident and the airplane was not reported overdue. Air traffic control (ATC) began receiving reports of an emergency locator transmitter near the accident site at 2252. The wreckage was subsequently located by the Civil Airport Patrol on May 19, 2016. The pilot had no contact with flight service or ATC prior to or during the accident flight; however, review of radar data revealed targets with a transponder code of 1200. The targets originated at RME and terminated near the accident side. The last recorded target was at 2241:56, indicating an altitude of 900 feet mean sea level (msl). According to the manager of a fixed based operator at RME, the pilot purchased 25 gallons of fuel during the day of the accident flight and indicated that he would be away for 1 week, but did not specify his destination. The pilot's father reported that he was not aware of the flight or its intended destination. The pilot, age 59, held a private pilot certificate, with a rating for airplane single-engine land. His most recent Federal Aviation Administration third-class medical certificate was issued on October 26, 2013. At that time, he reported a total flight experience of 300 hours. The pilot's logbook was not recovered. The six-seat, high-wing, retractable tricycle-gear airplane, was manufactured in 1966. It was powered by a Continental Motors IO-520, 285-horsepower engine, equipped with a McCauley constant-speed three-blade propeller. Review of the airplane's logbooks revealed that its most recent annual inspection was completed on November 25, 2015. At that time, the airplane had accrued 2,777.28 total hours of operation and the engine had accrued 1,471.66 hours since its most recent major overhaul. The airplane flew about 1.75 hours from the time of that inspection, until the accident; of which, 1 hour was the accident flight itself. The pilot had purchased the airplane in 2013. It had been operated for approximately 40 hours, from the time of purchase, until the accident. 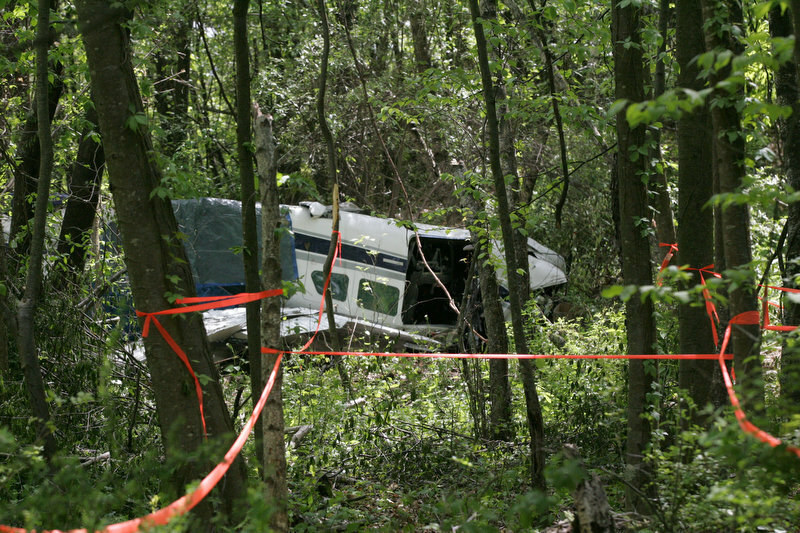 Sussex Airport (FWN), Sussex, New Jersey, was located about 6 miles south of the accident site. The recorded weather at FWN, at 2253, included wind calm, visibility 10 miles and clear sky. Review of sun and moon data from the U.S. Naval Observatory revealed that during the day of the accident, moonrise was at 1522 and moonset was 0339 the following day. The moon was waxing gibbous with 77 percent of its visible disk illuminated. A debris path was observed, beginning with severed tree branches and a section of left horizontal stabilizer and left elevator. The debris path extended approximately 200 feet on a magnetic course of 240 degrees to the main wreckage, which was at an elevation of 670 feet msl. The main wreckage was inverted, oriented about a magnetic heading of 300 degrees, with both wings partially separated at their respective wing root. Both wings exhibited buckling and leading edge impact damage. No fuel was recovered from the left or right fuel tanks; however, both fuel tanks were breached during impact. The flaps and ailerons remained attached to their respective wing, with the flaps observed in the retracted position. The empennage was intact and exhibited buckling. The vertical stabilizer and rudder also remained intact. The right horizontal stabilizer remained attached and a portion of the right elevator had separated and was recovered beneath the main wreckage. Control continuity was confirmed from the elevator and rudder to the cockpit. Continuity was also confirmed from the right aileron to the cockpit. The left aileron control cable had separated at the doorpost and exhibited a broomstraw separation. The left aileron balance cable remained intact. Measurement of the elevator trim jackscrew corresponded to an approximate 5-degree tab up (nose down) trim position. The cockpit remained intact and the pilot's lapbelt had been unfastened by rescue personnel. The landing gear was in the retracted position. The magneto switch was in the left position and the fuel selector was positioned to the left fuel tank. The throttle control was midrange and the mixture control was in the idle/cutoff position. The landing light was in the on position. The three-blade propeller remained attached to the engine. Two blades were bent aft and one blade remained straight. About 1/4 ounce of fuel was recovered in the fuel line from the engine driven fuel pump to the fuel metering unit. The fuel was bright, clear, and consistent in color and odor to 100 low-lead aviation gasoline. No other measurable fuel was recovered from the engine or fuel system. The top spark plugs were removed from the engine for examination. Their electrodes were intact and light gray in color. The valve covers were removed from the cylinders and oil was observed throughout the engine. When the propeller was rotated by hand, crankshaft, camshaft, and valve train continuity were confirmed to the rear accessory section of the engine. Thumb compression was attained on all cylinders and the magnetos produced spark to all top leads. A GPS was recovered from the wreckage and forwarded to the NTSB Vehicle Recorder Laboratory, Washington, D.C., for data download. Review of the data plot revealed that it corroborated the radar data, with the last recorded target indicating a GPS altitude of 1,005 feet, located about .20 mile west of the accident site. The plot also revealed a descent over a period of time, with an approximate right 90-degree turn, followed by a left 90-degree turn toward the end of the descent. The GPS data did not record the selected destination. An autopsy was performed on the pilot by the Morris County Medical Examiner, Morristown, New Jersey, on May 20, 2016. The autopsy report noted the cause of death as "multiple injuries" and there was no evidence of natural disease. Toxicological testing was performed on the pilot by the FAA Bioaeronautical Science Research Laboratory, Oklahoma City, Oklahoma. The results were negative for alcohol and drugs. There were no known witnesses to the accident and the airplane was not reported overdue. Air traffic control (ATC) began receiving reports of an emergency locator transmitter near the accident site at 2252. The wreckage was subsequently located by the Civil Airport Patrol on May 19, 2016. The pilot had no contact with flight service or ATC for the accident flight; however, review of radar data revealed targets with a transponder code of 1200. The targets originated at RME and terminated near the accident side. The last recorded target was at 2241:56, indicating an altitude of 900 feet mean sea level (msl). According to the manager of a fixed based operator at RME, the pilot purchased 25 gallons of fuel during the day of the accident flight and indicated that he would be away for 1 week, but did not specify his destination. A debris path was observed; beginning with severed tree branches and a section of left horizontal stabilizer and left elevator, and extended approximately 200 feet on a magnetic course of 240 degrees to the main wreckage, which was at an elevation of 670 feet msl. The main wreckage was inverted, oriented about a magnetic heading of 300 degrees, with both wings partially separated at their respective wing root. Both wings exhibited buckling and leading edge impact damage. No fuel was recovered from the left or right fuel tanks; however, both fuel tanks were breached during impact. The flaps and ailerons remained attached to their respective wing, with the flaps observed in the retracted position. The empennage was intact and exhibited buckling. The vertical stabilizer and rudder also remained intact. The right horizontal stabilizer remained attached and a portion of the right elevator had separated and was recovered beneath the main wreckage. 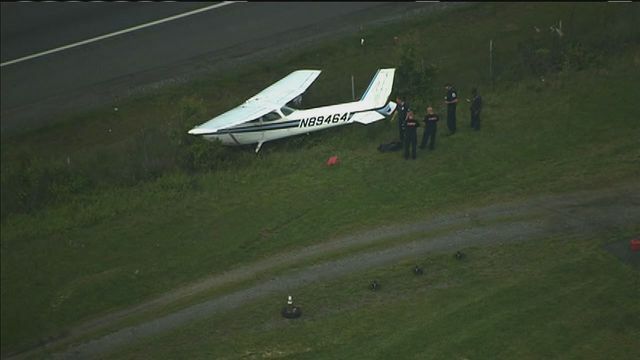 The pilot held a private pilot certificate, with a rating for airplane single-engine land. His most recent Federal Aviation Administration third-class medical certificate was issued on October 26, 2013. At that time, he reported a total flight experience of 300 hours. The six-seat, high-wing, retractable tricycle-gear airplane, serial number 21058801, was manufactured in 1966. It was powered by a Continental Motors IO-520, 285-horsepower engine, equipped with a McCauley constant-speed three-blade propeller. A GPS was recovered from the wreckage and forwarded to the NTSB Vehicle Recorder Laboratory, Washington, DC, for data download. 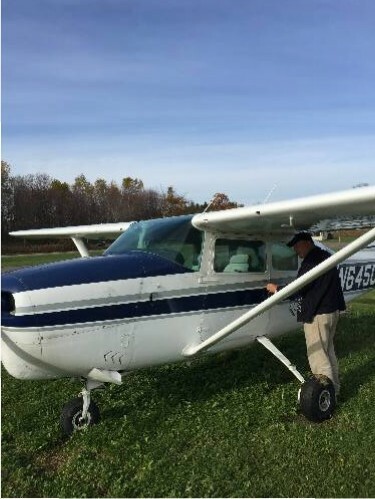 WANTAGE — Authorities have identified the pilot killed in a single-engine plane crash last week as a 59-year-old man with an Elmira, N.Y. mailing address, but they've not yet released his name pending family notification. Elmira, N.Y. police Chief Joseph Kane told NJ Advance Media his department checked the residence on file for the man last week, but the address was vacant and they've not yet been able to make contact with his family. Federal Aviation Administration spokeswoman Arlene Salac said the agency does not confirm victims' identities and refers the public release of victims' identities to local agencies. 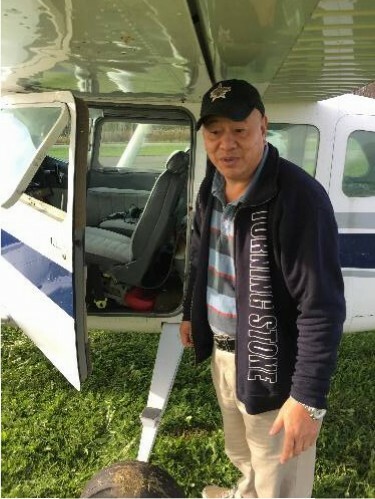 The pilot's body was found — and his Cessna C210 located — on Thursday in a wooded area near Unionville and Mount Salem roads in Wantage shortly before 11 a.m., New York Civil Air Patrol Incident Commander Maj. Bill Martin said in a news release. The plane was found inverted, with the wings torn off. The Civil Air Patrol had been searching for this plane since Tuesday after being alerted by the Air Force Rescue Coordination Center. Ground search teams were able to track the emergency locator transmitter signal to the Wantage field by Thursday morning. NJ Advance Media is not releasing the pilot's name pending family notification. 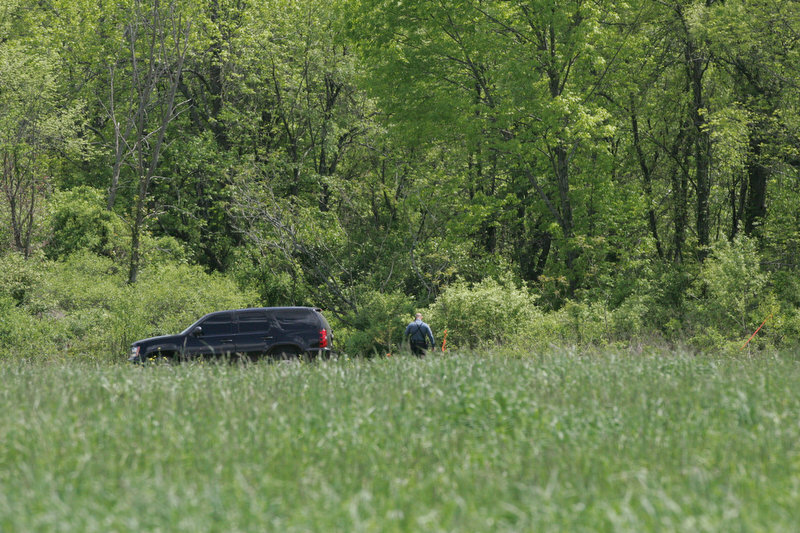 WANTAGE — A search team from New York located a downed Cessna 210 aircraft, found today, whose lone occupant was found dead inside. Civilian air patrols had been searching since Tuesday for the source of an emergency locator transmitter (ELT) signal. The plane was found inverted at 10:42 a.m., with the wings torn off, said Maj. Bill Martin, CAP incident commander. The wreckage was in the woods, about a third of a mile from Route 651. “All appearances are that the aircraft was trying to land in the field and hit the tree line,” Martin said. No missing or overdue aircraft had been reported, Martin said. The only clue was the ELT. Search aircraft from Poughkeepsie, N.Y., reported the signal in the vicinity of Sussex Airport. By Wednesday, aircraft and ground teams were focusing on Unionville Road in Wantage. A ground search today located the crash site. WANTAGE - The pilot of a Cessna 210 aircraft has died after the plane crashed in a wooded area in Sussex County. 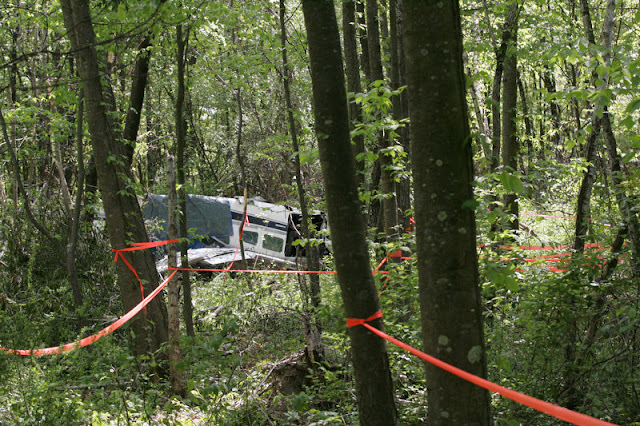 The plane was found upside down in the woods Thursday. Its wings were torn off and the pilot was found dead inside. Initial news reports said that the plane was reported missing earlier this week, but News 12 New Jersey has learned that this was not the case. Officials believe that the plane may have crashed on Tuesday. According to the Civil Air Patrol, a South Eastern Group ground team out of Poughkeepsie started to track an emergency locator transmitter signal. They set out to search for the signal on Tuesday, but did not locate the crash site until Thursday. Once the site was located, the team alerted the New Jersey State Police. It appeared that the pilot was the only person aboard the plane when it crashed. WANTAGE — One person was dead following a plane crash in Sussex County this week, State Police said. 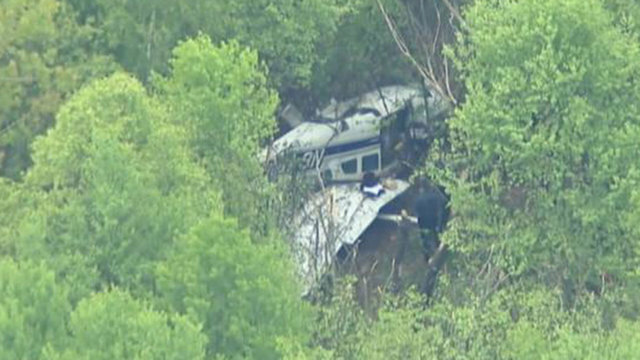 New York Civil Air Patrol discovered the single-engine aircraft Thursday morning, Williams said. The plane was first reported missing on Tuesday. 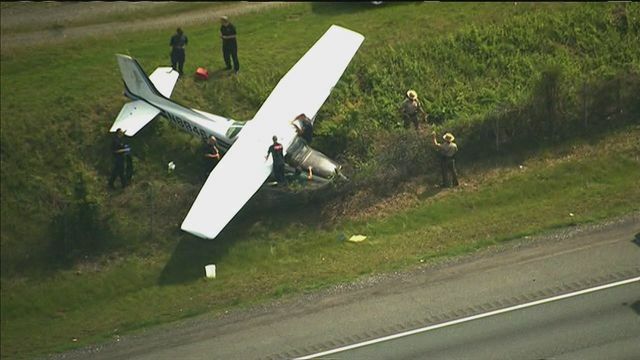 Federal Aviation Administration spokeswoman Arlene Salac said the plane was a Cessna 210F Centurion. The FAA will investigate and the National Transportation Safety Board will determine the cause of the crash, she said.